This morning, I decided to make a quiche for breakfast. I love quiche. In fact, I love all kinds of egg custard type dishes, but quiche is near and dear to my heart and has been a favorite of mine since I was fairly young. I was first introduced to the wonders of this eggy concoction when I was in middle school. There was a product in the…ahem…1980’s that was called “pour-a-quiche” and my mother used to buy it. 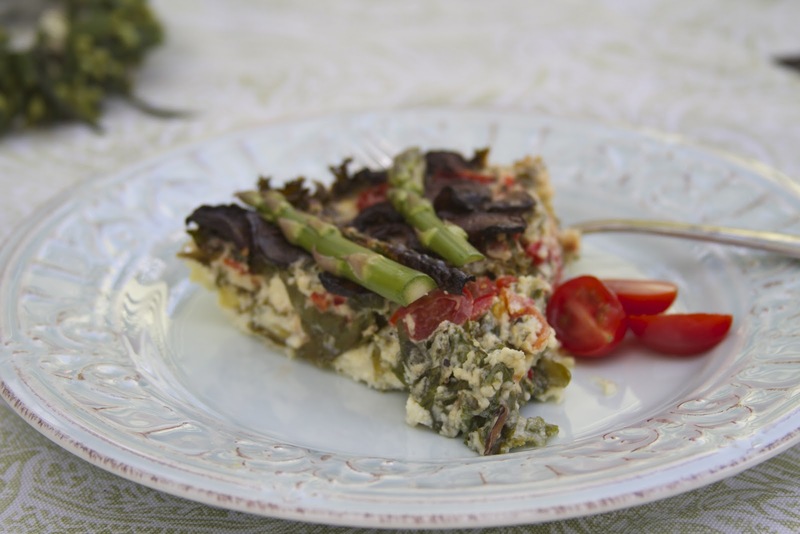 Now, this product came in a milk carton and it was just as the name said, you simply poured the pre-made quiche mix into a ready-made pie crust and popped it into the oven! Hey, we liked instant stuff back then! Later on, when I went to college, one of favorite professors, who was also a fabulous gourmet cook, made me one of her quiches. It was the most amazing, decadent, wonderful dishes I had ever had. It was lovingly baked in a homemade, buttery pie crust and filled with spinach, bacon, ham and cheeses. It was divine. It was rich. It was completely calorie-laden, but that didn’t matter because I had the metabolism of a 20 year old! She gave me the recipe, which took about two days to make. Now, when you’re in college, you simply cannot fathom anything taking two full days to get onto the table (hello, Top Ramen) and sadly I never made that recipe. Now fast forward to today, and though I still love quiche, I make it a lot less decadently, because my 40-something metabolism just isn’t what it used to be. You’ll notice that the quiche is missing a crust and it’s also missing something else: cheese. 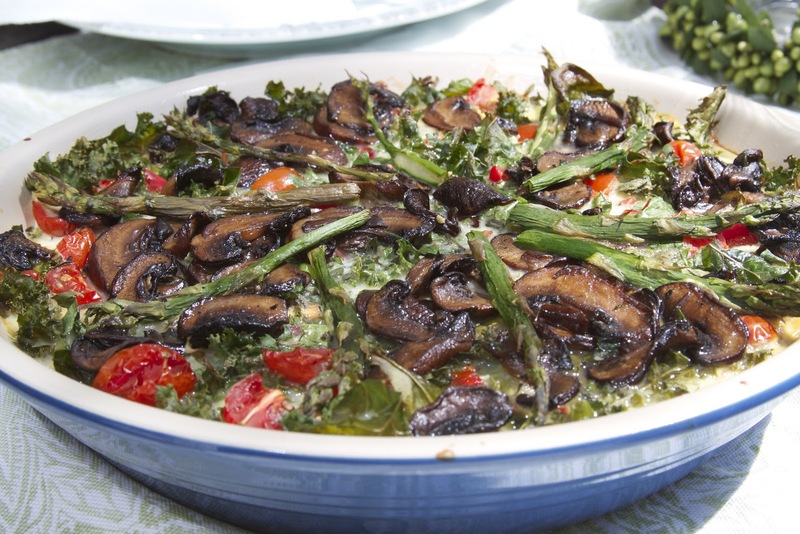 But it’s loaded with a lot of great vegetables and leafy greens and it still tastes a little bit decadent! 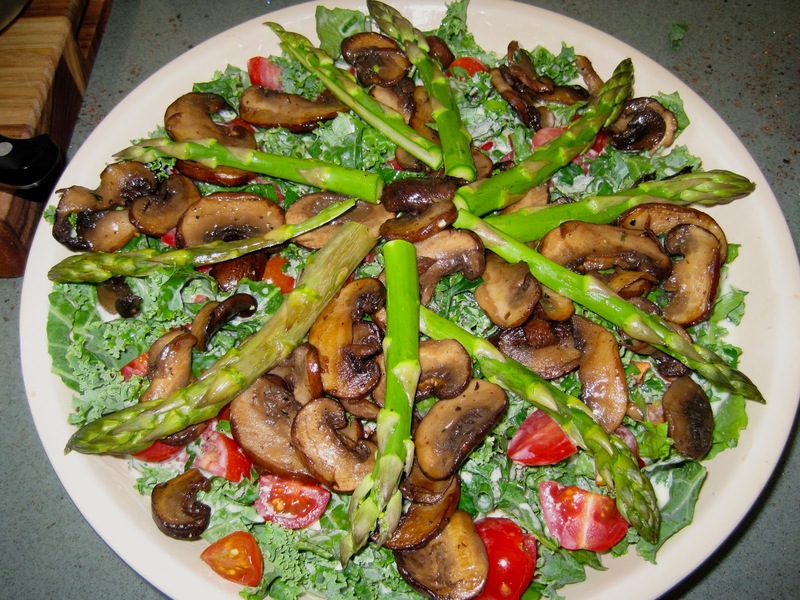 I adapted this recipe from Alexandra’s Kitchen, one of my favorite blogs. The original recipe calls for creme fraiche, which I love, but it contains quite a bit of fat and calories. I have found that substituting 0% fat Greek Yogurt for creme fraiche is a great way to shave a few calories, fat and cholesterol in the dish without sacrificing the flavor. Since I’m always looking for opportunities to add more vegetables to a dish, I also added quartered grape tomatoes along with some tomatoes from the garden, two tablespoons of chopped red bell pepper, fresh arugula and sautéed mushrooms. You can also use whatever combination of herbs that you enjoy. 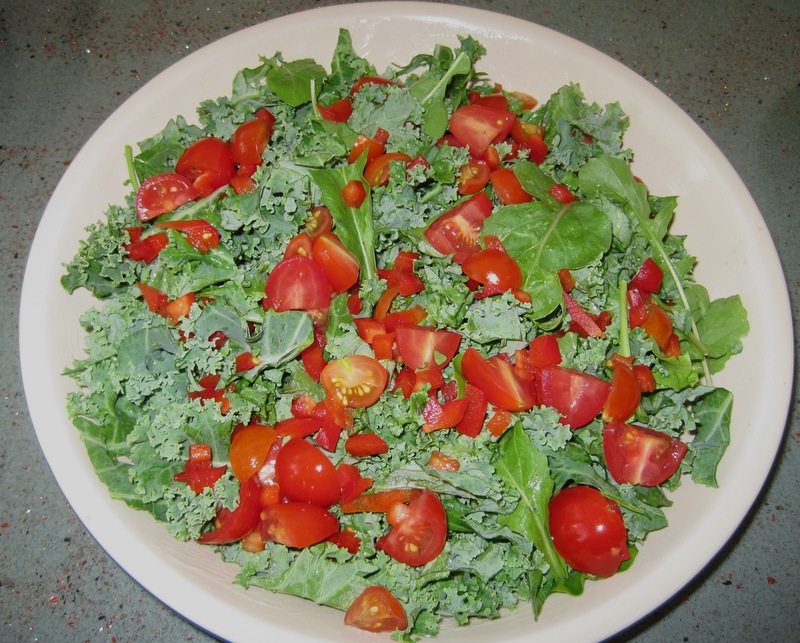 I used a tablespoon of thyme, along with some minced parsley and sage and green onion that I had in the garden. Preheat the oven to 375 degrees fahrenheit. Place one egg and 3 tablespoons flour into a bowl and whisk until smooth. Whisk in the remaining 4 eggs until blended. In another bowl, whisk the milk and the yogurt until smooth. Pour the egg mixture through a mesh sieve held over the milk and yogurt mixture. This will remove any lumps of flour. 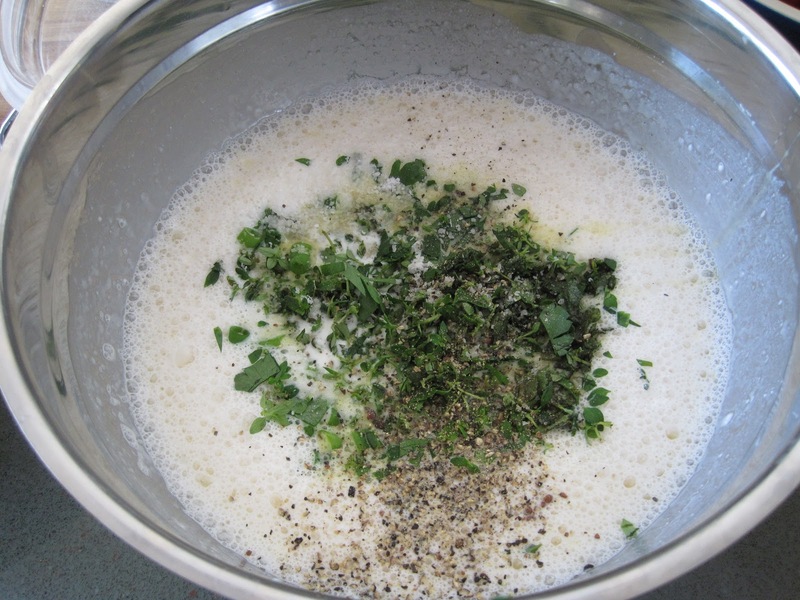 Whisk in the salt, pepper and herbs. 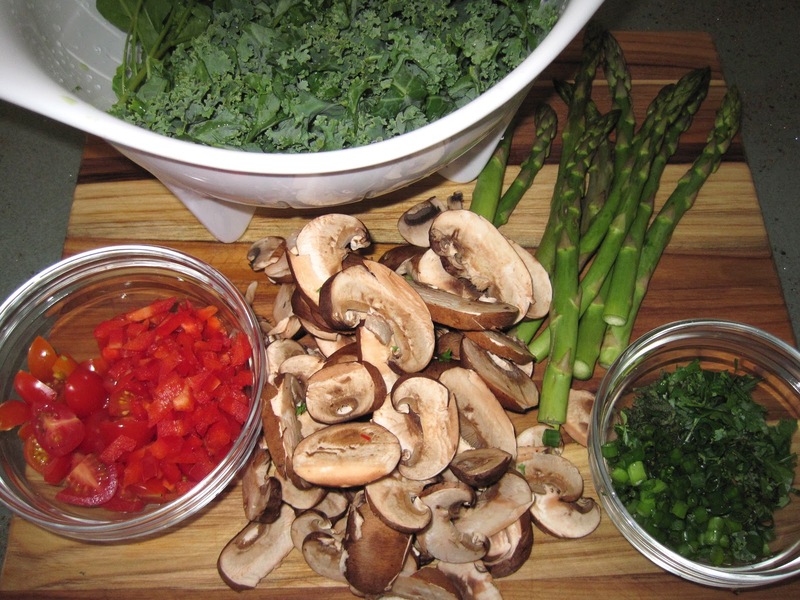 Pile your greens into a buttered or oiled pie dish along with any other vegetables you are using. I like to sauté the mushrooms first in a little olive oil and butter so that they release their moisture before before they are added to the quiche. Pour the egg mixture over the greens. Don’t panic if it seems like there isn’t enough liquid in the pan. Gently press down on the greens and vegetables to submerge them as well as you can, but don’t feel the need to add additional liquid! As it cooks, the greens will shrink and the custard will rise. Place in the 375 degree oven and bake for ten minutes, then lower the temperature to 325 degrees and bake for approximately 30 additional minutes. The center of the quiche should feel slightly firm when touched. Allow the quiche to rest for 20 minutes before slicing. Now, today, it was completely squirelly for me. I have always had to increase the baking time on this quiche and today was no exception. I baked it for 35 minutes and took it out and allowed it to rest while I took some photos. After it had rested, I cut into it only to find that it wasn’t fully set in the middle. I had to put it back into the oven for a little while longer. I probably should have baked it for a total of 55 minutes. Well, we had tickets to see an early matinee of “Star Trek: Into Darkness” in 3D and due to the extra baking time there was no wiggle room for 20 additional minutes of resting time. The first pictures I took were a mess, because the quiche just spread out on the plate like a blob! I had to take the finished shots after we came home this afternoon with a piece that had had time to cool! I +1 your recipe and gave you a shout out on Google. I also bookmarked this to try. Thank you so much Patty! I really appreciate the shout out and that you checked out my blog! Have a fantastic day!